I had a nice visit recently with Rick Morris, the Stokes County Manager, at his office in Danbury. This is his second stint as manager. He served previously from 2003 to 2006 and he returned this past summer to once again take up the challenge of managing the county. Rick is a retired Army colonel who worked for the past five years with a military consulting firm in Alexandria, Virginia. Stokes County is an interesting place. 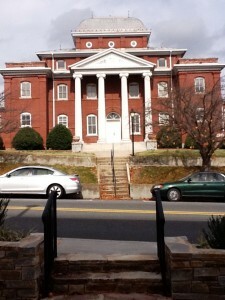 Danbury is a smaller-than-average county seat, and the county offices and the courthouse are located just outside of town. Hanging Rock State Park sits roughly in the middle of the county, and it has its own small mountain range (the Sauratown Mountains) located entirely within its boundaries. The Dan River flows through the county and is another recreational attraction. It has some economic development impact through small businesses that provide services to folks who want to float the river in canoes or on inner tubes. The county lacks any motel for people coming to enjoy the outdoor attractions or just passing through, however, which limits the economic impact of tourists. A major issue that Rick faced upon his return gives you a feel for the challenges confronting a small-county manager. Stokes-Reynolds Memorial Hospital is a county-owned hospital located near Danbury. Without any experience in health care, Rick had to determine whether to renew the existing management contract or enter into a new relationship with a different service provider. He had to get it right. In addition to offering convenient health care to its residents, the hospital employs over 200 people in highly desirable jobs. Rick also had to immediately put together a proposed budget in a very challenging fiscal climate. Working on those and other issues for the county meant a lot of late nights for Rick and his colleagues. Rick attended the county administration course in his first tour of duty as manager. He brought solid management skills to the job, but he found the course especially helpful because he was brand new to local government. In thanking him for paying the county’s membership dues, Rick observed that the dues provide a wonderful metric for our performance. If local governments did not believe that they were getting a good return on their investment, they would stop paying. Period. He finds our services valuable, and he even mentioned that Frayda Bluestein had been helpful on a challenging open meetings issue the previous day. Like all of his colleagues, Rick feels strongly that webinars are a valuable way to get information to officials who otherwise cannot attend courses in Chapel Hill. He encouraged the School to continue exploring alternative delivery mechanisms. It was clear that Rick is a strong supporter of our work. Rick wondered whether we might offer a service that his consulting firm offered to the military. In essence, the firm contacted military leaders and asked them to identify a few of the hardest issues that they were trying to solve. The firm then would pull together a hand-picked panel of its senior consultants to work on those issues and then report back to the military with their preliminary ideas for resolving them. It provided the consultants (all retired senior officers) with a means for staying updated on current challenges facing the military, and it gave the military leaders some expert insight at no cost into their most vexing issues (plus it opened additional consulting opportunities for the company). It is an intriguing idea. We certainly stay current with the issues through our direct advising work, but what do you think about the idea of occasionally pulling together a team of our folks (and possibly others) to work on sticky issues identified by city and county managers? Rick’s firm referred to these as “greybeard panels,” but he agreed that our folks might prefer a different name. What do you think about the expert panel idea? Special thanks to Norma Houston for offering to follow-up with Rick on a complicated purchasing question that he identified during our meeting. Just one more example of our responsiveness. In your case, Richard, absolutely nothing. Mike – RE: expert panel idea – worth exploration in my view. I think we would need to probe city/county managers of similar circumstances (size of county, relation to a metro center; Tier I, II, III etc.) to be have the challenge framed in such a way that an expert panel is meaningful. You-Carl might want to approach NCCCMA and we may want to seek some input from COGS, given their focus on regional needs/services.